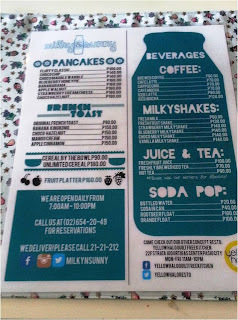 My All-day-breakfast series will kick-start with this charming restaurant at Kapitolyo, Pasig. 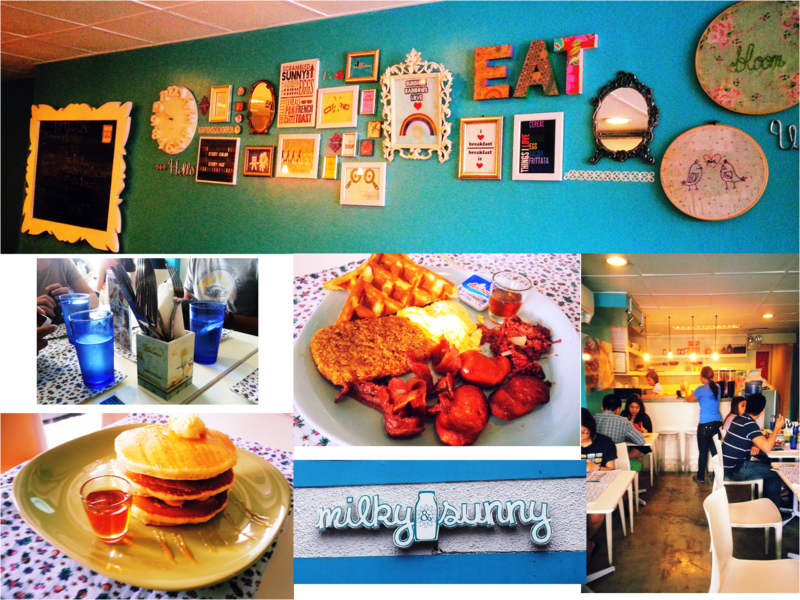 Self-renowned as the sunniest resto, Milky and Sunny proved to bring shiny kisses from the sun with an all-day breakfast menu. The place is rather small and sandwiched between two other establishment in a building. So parking can ba a bit challenging. When you enter, you will instantly notice their welcoming spirit. Even kids are very much welcome here. I could easily identify it with baby thingies. Children's books are displayed on the table upon entry and weekend can be hard to get a slot. The blue wall on the right imbibes a homey feel with a play of vintage and modern wall decor. While on the other side are photos of their menu offering, which kind gives you a hint of what to expect and probably to order. 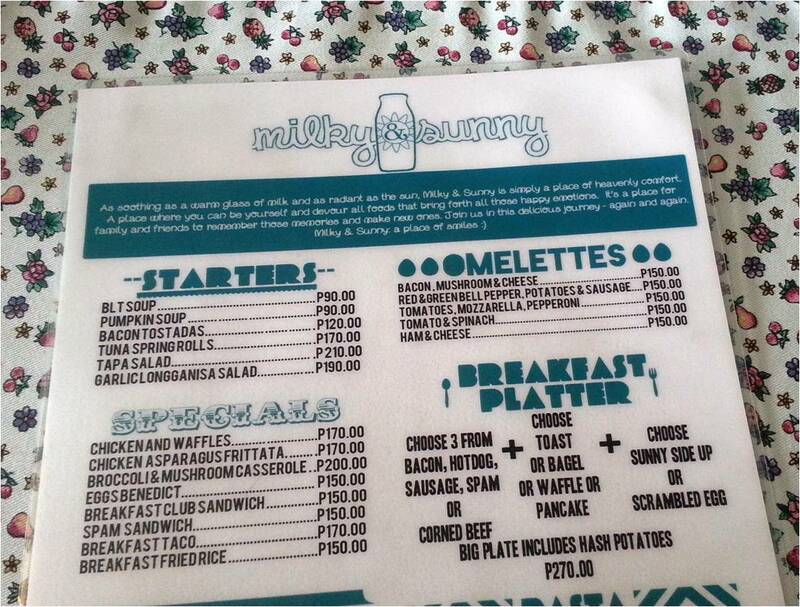 The menu is downright simple but the list is teeming with our favorite wake-up food, power-brekkie and all-time favorite snacks. Even the pasta dishes have been given the breakfast tweak. 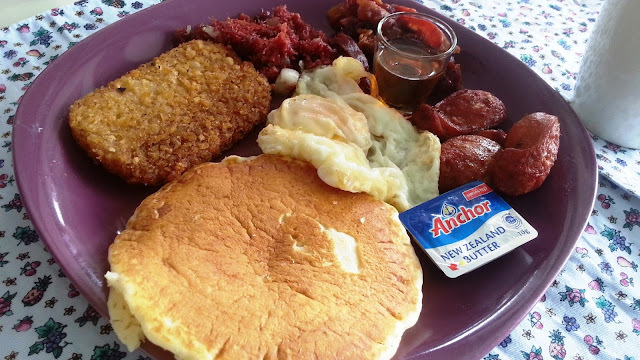 But to really get great value and try different dishes in one plate, opt to have their Breakfast platter. For P270 you get to choose not one, nor two but three entree; your carb in the forms of toast, bagel, pancake or waffle; your kind of egg and hash brown. Here is what I got on my first visit. 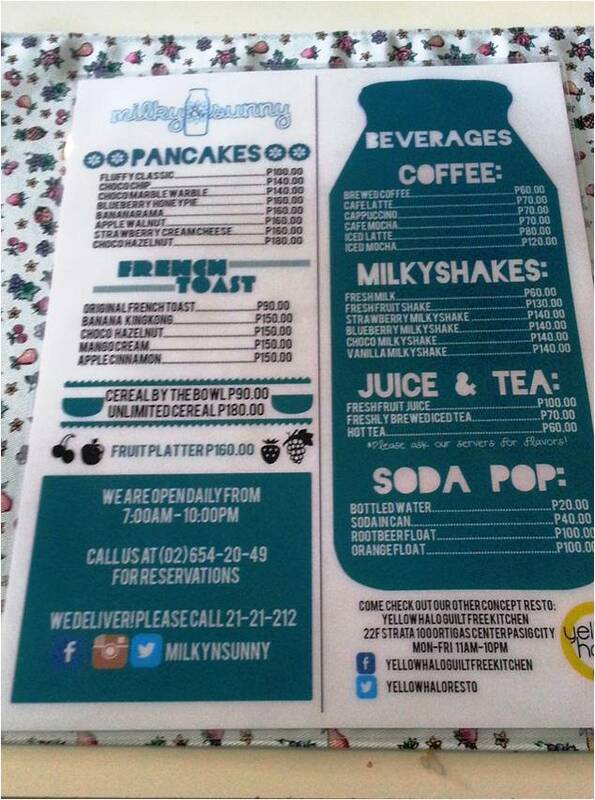 Their pancake is also notable. 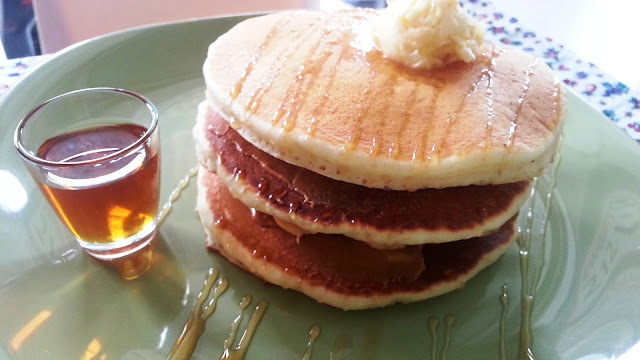 I always look on how fluffy and soft a pan cake is without having a lot of air pockets in it. Don't be fooled with my photo, these pancakes are huge and dense, which means they don't skimp on valuable pancake ingredients. 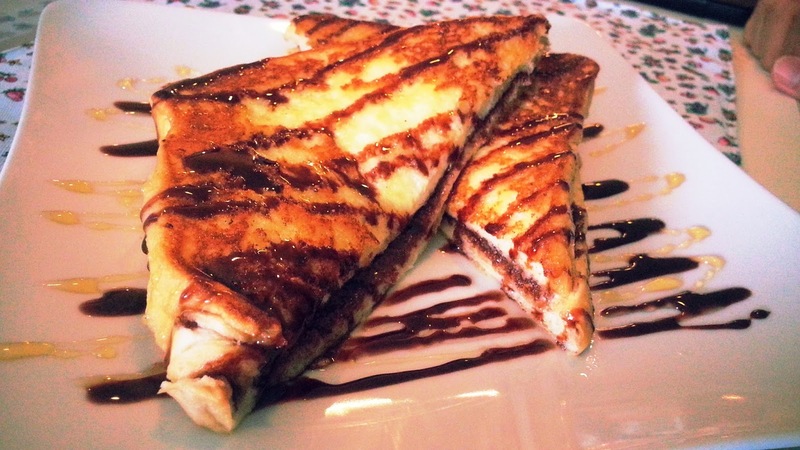 If you love pancakes you can also have some at 14 Four Cafe where I had my favorite which is Cinnamon Bun Pancake. I would also recommend their waffles, if you want a hotcake that is a bit crunchy and hard on the outside but soft on the inside. My blogger seatmate had this Choco-hazelnut French toast. Judging by the plating, the appetizing factor really is high, but when I had a taste, it's not the hazelnut spread I have been accustomed to, it still is chocolatey though but not the one I was expecting. If you are looking for a fancier meal, why not have a breakfast burrito, which has rice inside and the usual burrito ingredients. Their pasta selections are also interesting. This is the first part actually of our Kapitolyo, Pasig food trip. Next stop is Poco Deli for lunch and Charlie's for Meryenda. Thanks again Avida Land for hosting this event for us!